Either way, as polarizing as the 2008 Chevy HHR SS styling may be, it’s got a low, beefy presence that appeals to many. Plus, that turbocharged engine. Let’s be frank, the Chevy HHR SS looks weird. An elongated, round front end with aggressive shoulderlines; huge flared out fenders; a chopped rear end like a hearse on steroids—the HHR SS ain’t normal. But like most ‘weird’ things out there, you either love it or you don’t. And the HHR SS is no exception. Get behind the wheel, however, unleash the 260-hp turbo powerplant, and styling becomes an after-thought. You’ll never have so much fun looking so strange in your life. To be fair, the HHR (stands for Heritage High Roof) is a retro-styled wagon, so it’s supposed look different. It’s supposed to look cool, like the PT Cruiser’s younger, hipper brother, but targeting a much younger demographic. Unlike it’s LS and LT trim siblings, this SS model has performance in mind. 18” wheels wrapped in P225/45R-18 tires and a rear mini spoiler will quickly give this away. Exterior styling also includes deep tinted rear glass, front fog lamps, and body coloured power remote side mirrors. The interior is roomy and the cockpit is laid out well. The instrument cluster is simple with stylish looking gauges that aren’t oversized as you may expect. And the boost gauge on the A-pillar is a nice sporty touch too. A storage compartment up top above the centre instrument cluster is handy for storing your shades, wallet, and other small stuff. The seats are comfortable with decent bolsters (8-way power adjustments driver side only). Equally as important, the seats look hot, wrapped in premium cloth with the SS embroidered logos. Adequate rear cargo space is increased with 60/40 split rear seats, and a flat folding front passenger seat to load your surfboard (or snowboard) as the advertisements depict. Standard equipped audio comes in the form of a 6-speaker system with an MP3 capable CD player, as well as an auxiliary input jack. Upgrade to a 6-disc CD changer with premium 260 W, 7-speaker system with a subwoofer, and XM satellite radio. Power windows/doors, remote keyless entry, leather wrapped steering wheel, and cruise control come standard. The power sunroof and performance driver’s seat are optional. Dual stage frontal airbags are standard, but you’ll need to fork out about $600 extra for head curtain side-impact airbags. Steering is super-responsive; handling is tight and fun; ride comfort for passengers is not so great, but stiff performance suspension certainly is. The 2.0L DOHC I-4 turbo engine puts down 260-hp. And the short-shifting 5-speed manual transmission brings it to life. This ride handles so well, and is so fun to drive. Whether you dig the styling or not (and for the record, the SS styling grew on me really quick), looks aren’t everything. 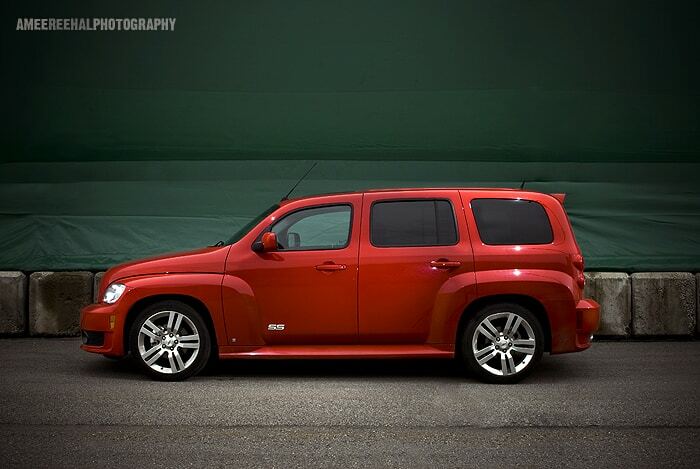 So get over yourself, get into the Chevy 2008 HHR SS, and have some fun. Trust me, you will.